In the first centuries after Jesus’ death, he was never depicted suffering on the cross. When artists finally began depicting him on the cross, he was shown either in a peaceful repose or as a king in glory. Other medieval crosses were studded with precious jewels. 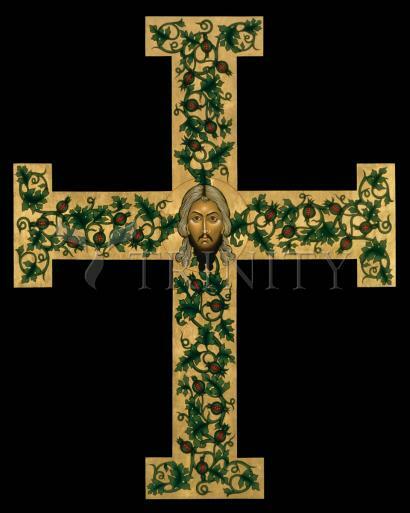 A third type of cross was the Tree of Life, filled with vegetation and harkening back to the Green Man revered in the old religions of northern Europe. Realistic crucifixes that graphically depict Jesus in his death throes were an innovation of the late Middle Ages. In this icon Jesus is the Tree of Life. He shines at the center of four arms that stretch to the four sacred directions -- reminiscent of the Native American medicine wheel. He is the center of creation. Exotic vegetation coils from him, or towards him, depending on one’s perspective. He is the fulfillment of the ancient Green Man of old Europe, as well as the vine spoken of in John’s Gospel. He is the World Tree, Yggdrasil, the pole of the universe, upon which shamans and other mystics travel to experience the divine. Having become part of creation, and unjustly executed, he is the advocate of all those who have been trampled underfoot. Slain on the cross, but risen, he declares that God’s greatest miracle is to bring life and light even out of injustice and death. The Norse world tree, omnipresent, its branches extending over all the known worlds, its roots extending into three of them. The name means Odin's Horse referring to the time he "rode" upon the tree and learned the runes. It is also at times referred to as Hoddmimir, Tree of Mimir, and Lærád or Lerad. It is usually called an Ash tree. One of Yggdrasil's roots extends into Asgard, a second root extends into the world of the frost giants while the third is in Niflheim. This is Snorri's description which, of course, differs from that in the Poetic Edda. Grimnismál has the roots extending into the giants realm, Hel's realm, and one into Midgard. An eagle sits in the branches of the tree and between its eyes perches a hawk. There is a squirrel called Ratatosk which scurries between the eagle and Nidhogg carrying messages. Nidhogg is the serpent which gnaws at Yggdrasil's Niflheim root. Along with this menagerie are four stags running in the branches eating the leaves, Heidrun the goat and Eikthyrmir the hart also eating leaves. With all the munching going on the tree needs tending -- that is the task of the Norns at Urd's well under one of the roots. The Norns pour water over the tree every day keeping its bark white. The tree produces honeydew and also berries which help women with pregnancy. It appears to be the giver/ nourisher of life so it is not surprising when we read that the first humans Ask and Embla were created from trees (one being an Ash) or that two humans Lif and Leifthrasir will hide in the tree during Ragnarok with the tree's honeydew sustaining them until they can go on to restart humanity. The world tree was a symbol common to many societies. The tree specifically connecting the three regions of man, heaven, and the underworld appears in eastern mythology. Also Odin's nine night suspension in the tree's branches is similar to Finnish shamanistic practices with a nine night stay in a birch tree. The origin and true meanings of the Green Man are lost in the mists of time which only adds to the air of mystery surrounding him. It is suggested he represents the regeneration aspects of spring and fertility. Some books on the subject expound him as Pagan, while others proclaim him a symbol of Christianity. It is true in some churches he is prominently displayed for all to see, giving credence to those who say he was sanctioned by the church. But this may not always be the case as in some churches he is well hidden. So, what of his origins? The earliest examples of the Green Man known are from Classical Rome. From there he spread north into Europe and into Britain where he is found in various guises in churches and other buildings. He is also depicted in Celtic art from before the Roman conquest of Gaul.He is found in many of the Gothic churches in Britain and Europe, that is the period of architecture prevalent in Western Europe from the 12th to 16th Century including the Early English, Decorated and Perpendicular styles. The Green Man is varied in style. In some examples vegetation exudes from the mouth, ears, nose or eyes to encircle the face, or his features are formed entirely from vegetation. There are so many variations on the theme, for example sometimes vegetation appears to sprout from above or below the eyes. While in others the face peers through vegetation. The landscape of Britain at the time The Green Man was being carved in our churches was much different than that which we find today. Trees dominated vast areas of the country. The Weald of Kent, Sussex and Surrey are the remains of a massive swathe of woodland which covered much of southern England. Trees were revered, it was believed they had souls and as such should be treated accordingly. Trees were consulted as oracles over important matters. Sacred groves were also planted. Could the representation of the Green Man be a form of the 'tree spirit'?